Mesa Verde National Park is located in the high plateau country of southwestern Colorado. The park lies atop a high mesa that rises from the canyon of the Mancos River, a tributary of the San Juan River. The Mancos has cut a deep, broad valley along the eastern and southern edge of Mesa Verde, which in turn is dissected by 15 canyons formed by smaller streams. This erosional action has thus created many smaller mesas. Two of these, Wetherill and Chapin mesas, provide the primary access to most of the park's public archeological sites. Mesa Verde National Park encompasses 52,122 acres, about 81 square miles. It runs about 9 miles both east-to-west and north-to-south. Elevation on Mesa Verde varies between 6,000 and 8,500 feet. 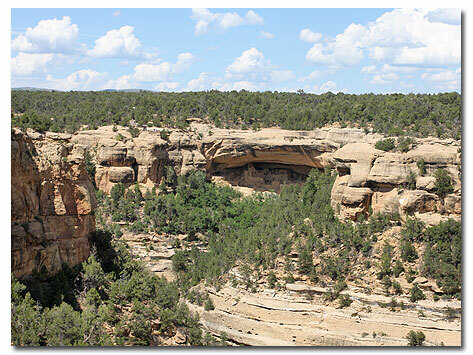 Mesa Verde enjoys a fairly moderate climate for its elevation but is generally colder than most areas of the deserts. Winters are mostly sunny but cold. Average midwinter (January) highs are about 40 degrees F. with lows of about 15 degrees F. Cold-snaps do occasionally occur but are short-lived. Winter snowfall averages about 90 inches a year causing closure of most of the park. The park re-opens in the spring as the weather warms and occasional rains bring wildflowers to high country meadows and mesa tops. 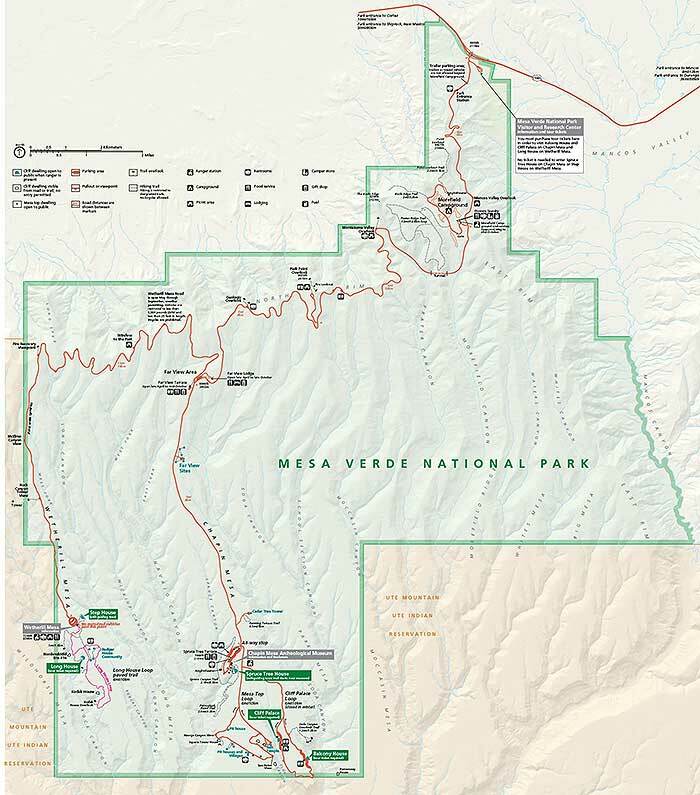 During the summer, temperatures seldom reach more than 85 degrees F. July's mean daily maximum is 82 degrees F.; its mean daily minimum is45 degrees F.
The Mesa Verde National Park entrance is midway between Cortez and Mancos, CO off U.S. Highway 160. From Cortez, travel 9 miles east to the park entrance. From Durango, CO travel 36 miles west on Route 160 to the entrance. 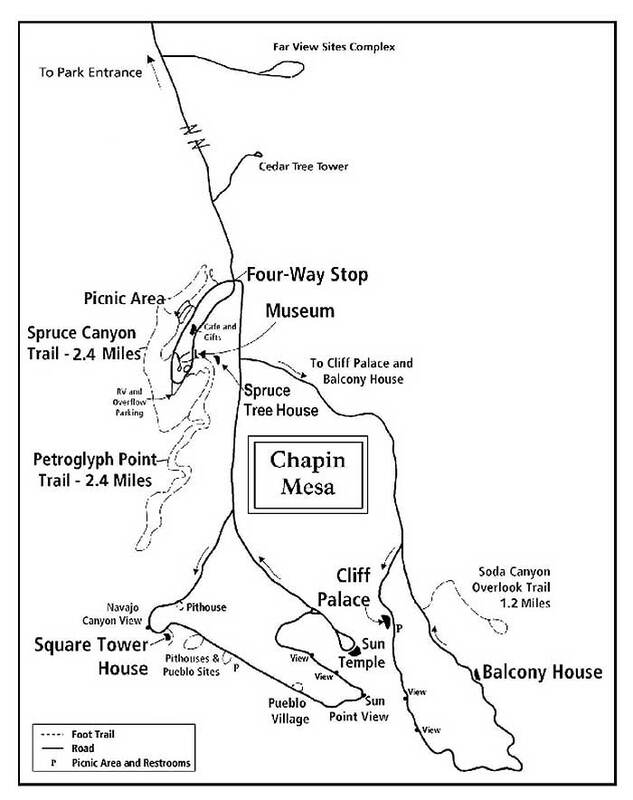 It is 21 miles from the entrance to park headquarters and the Chaplin Mesa ruins. 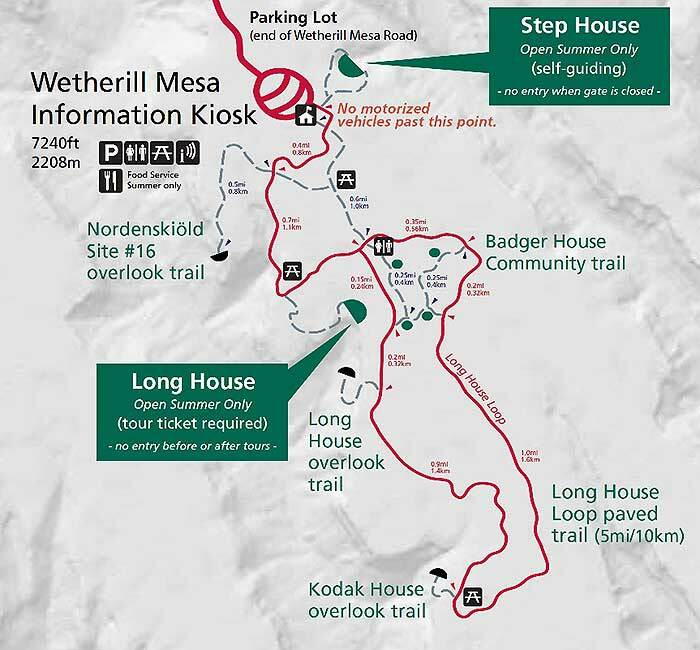 Morefield campground is 4 miles from the entrance; Far View Visitor Center is 15 miles. Allow at least 45 minutes for the drive to Chapin Mesa. There are daily scheduled flights to Durango, Colorado; they also have car rental service. Bus service is available from Grand Junction, Colorado and Gallup, New Mexico to Cortez. The nearest railroad terminals are Grand Junction, Colorado, and Gallup, New Mexico.